Yes, please, Marvel, keep reminding us that in Old Man Logan's future, the Hulk spawned an entire clan of psychopathic, cannibalistic, inbred rednecks with his own cousin. We couldn't just fade out on a happy note from last issue. Noooo, still gotta keep going. Where was She-Hulk, anyways? There was the new born baby, which kinda implies she was still around recently. She was seen in a flashback in this series being killed with the other heroes when the villains rose up. I'm assuming the story has been retcon. So who did Hulk have babies with? ...I dunno. Red She-Hulk? ...let's go with that. Bruce Banner had at least one daughter. Her name was "Miss Bobbie -Jo Banner". And she was breast feeding Junior while she and the rest of the Hulk Gang were riding around in the Fantasticar. So Hulk had kids with his cousin and then knocked up his own daughter for extra disgusting layer. Re: Bruce Banner had at least one daughter. This issue showed he had several other daughters. Man, I'd managed to repress that detail right up until you pointed it out, even when reading these scans. 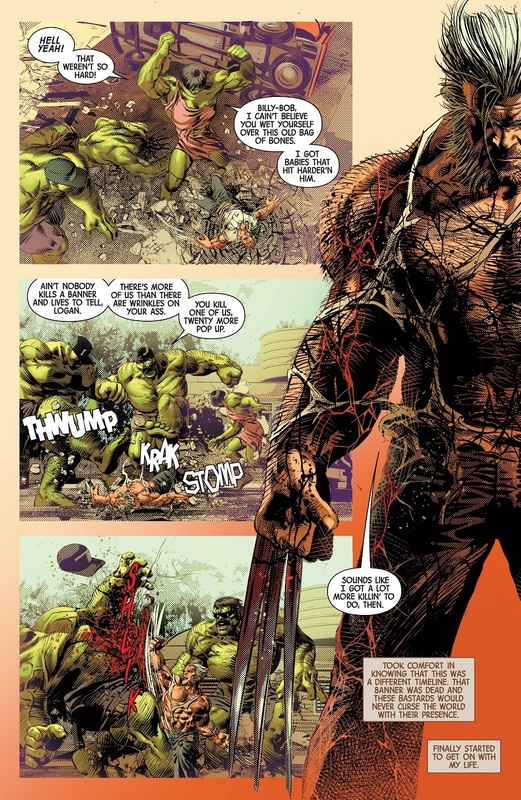 Do the wasteland Hulks not have a healing factor? Killing a Hulk should not be this easy. 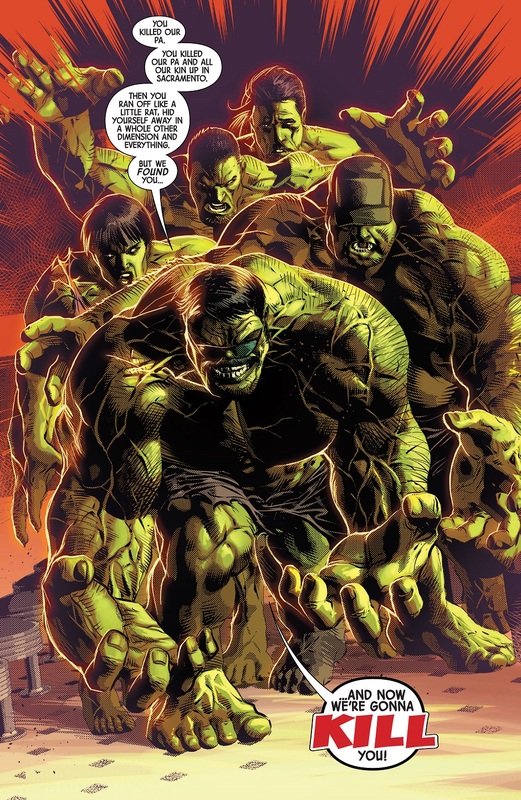 If they're actually Hulks, and not some complicated disguise / robots / shapeshifters / some other nonsense. Though given how easily they went down back in the original miniseries, they probably just aren't as resilient as The Hulk. On that note: why the heck were Logan's kids so easy to kill? 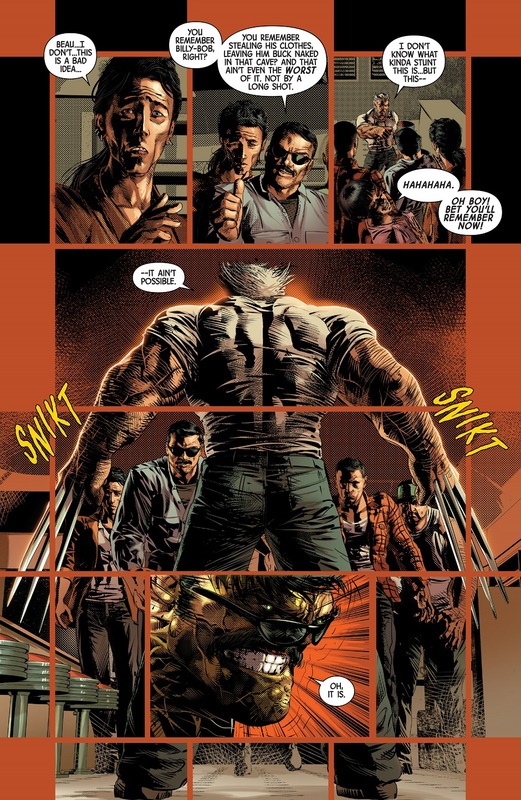 All the other Snikt-lings & Bub-lettes have his healing factor & some variant of bone claws. I'm going with Mo Inbreeding Mo Problems. Maybe they're, like, anti-Hulks? Logan's smacking them around on that last page like he's the green one. But then, Old Man Logan killed half the X-Men in one go while hallucinating that they were supervillains. We should probably just assume he has magical carnage powers that activate whenever characters from the original miniseries show up. So... we have a bunch more Hulks in our timeline now? This is starting to get out of hand. I don't think we need Mutants, Inhumans, AND Hulks. Bit of an exaggeration there, since OML keeps killing them. Besides, the only Hulks we have are Cho and Jen. More seem to keep showing up, too. And what about the red one? "Ain't nobody kills a Banner and lives to tell, Logan!" Wasn't Hawkeye literally one of the last surviving heroes left in the Badlands? That's irony for ya. Sure... 40-50 years after killing Bruce. Except Bruce Banner was very much alive until Old Man Logan killed him and Hawkeye is killed before that happens. This is misguided as a direction for a couple of reasons. 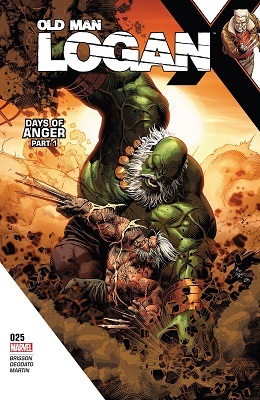 First of all, the whole point of bringing in the Old Man Logan character was to (poorly, imo) attempt synergy with the the Logan film, bringing in elements of the original series like this only serves to remind us that Logan the movie had almost nothing to do with the Old Man Logan storyline and frankly, was better for it. Second, if they are going to dive back into that universe, this is the worst possible approach. It's literally just rehashing one of the major conflicts of the original mini, and frankly the whole inbred Hulks thing is one of the least compelling elements which holds up worst under scrutiny. It would have been far more interesting to see other elements of the universe explored. The high concept of Old Man Logan (high concepts being the one thing that Mark Millar excels at) is that of a post-apocalypse in a superhero universe, do something with that. Show us some of the X-Men who weren't caught in Wolverine's deluded and highly improbably slaughter, show us some weird extrapolated legacy, show us Skrulls slumming it on Earth and laughing at the fall of their ancestral enemies. Do something, anything, that requires the slightest amount of original thought. Well, Maestro leading the Banner clan is interesting. The problem is that Maestro is out of Logan's league, last time we saw him he was fighting Elder's of the Universe and winning! I mean I like the Maestro well enough for what he was coming out of Secret Wars, but this doesn't strike me as a particularly interesting thing to be doing with him, given that it's just awkwardly jamming him into the setup of the mini. Sure there'll be some differences in how he handles himself, but this still boils down to a retread. Like. 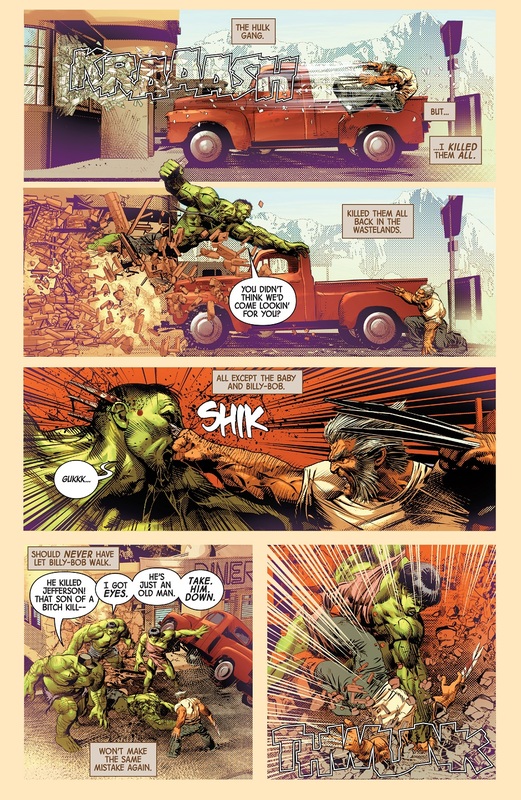 I just don't see much point to having Old Man Logan fight Hulks. We've seen that, it was the most memorable part of the original mini. Do something different. ...on Battleworld. Stick doesn't even have any damn superpowers. He's just an old martial arts dude...with a stick. Did you read the issue? Or even just those panels. Because it wasn't Stick that defeated Maeastro. You say it like Stick beat him in a fight, which is clearly not what happened. And the Granmaster Didn't do anything, unless you are talking about The Collector. Even then he wasn't the one that captured The Maestro. In fact, Maestro beat up both the Collector and the Grandmaster to gain possession of the Iso-Sphere in the first place. Which is what I was referring to. And clearly Maestro escaped, so obviously the Collector could not Hold the Maestro. So what is your point exactly?